This may be my family’s greatest Thanksgiving dish. It is annoying to make but so great to eat. 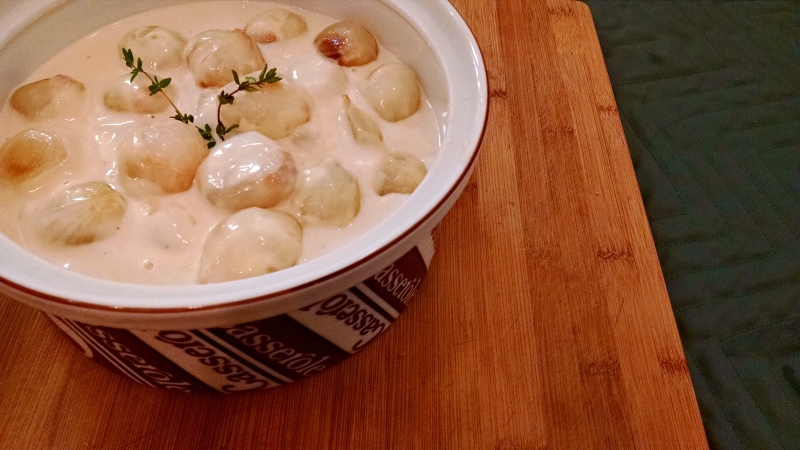 Do not wimp out and use frozen pearl onions. No good. Those bags of pearl onions you see in the store? Don’t use those, either. They are too small and it’ll take forever to prep enough to make a full dish. Cipollini onions are an okay-ish option, but they don’t roll properly and therefore won’t brown evenly. What you really want, and what are increasingly difficult to find (at least in our area), are “boiling” onions, which are white, round, and about 1″-1.5″ in diameter. Good luck. My parents got the casserole dish we’re serving this in back in the 70s. It’s beautifully retro. C is not for Cookie. 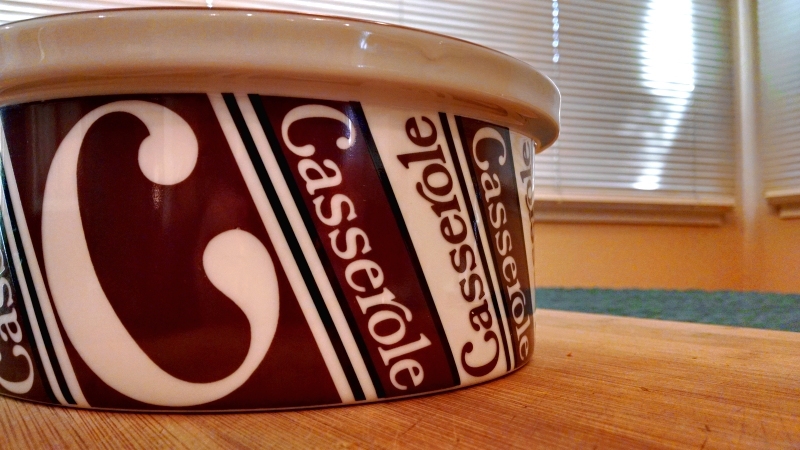 It is for Casserole! Drop the onions into rapidly boiling water for 1 minute. Shallowly trim the root end, squeeze the onion out the root end (they’ll pop out once you apply enough pressure, be quick catching them! ), then trim the top and cut an X 1/4″ deep into the root (this keeps them from bursting throughout the rest of the cooking). Heat the oven to 350. Toss the peeled onions in olive oil to coat and sprinkle with salt. Put them in a roasting pan large enough to hold them in a single layer. Roast onions until they are tender, 30–45 minutes (really depends on the size of the onions, though). Check for doneness with a sharp paring knife. Every 10–15 minutes, roll onions around so they get browned evenly. Place the cooked onions in a frying pan or saute pan large enough to hold them in one layer. Add sugar, white wine, water, and butter. Reduce this to a syrupy state, rolling the onions around to glaze. When reduced, add the cream and thyme. The cream should come halfway up the sides of the onions (this usually takes about a quart for us, it may be more or less depending on the size of the onions and the size of the pan). Simmer until the cream reduces to a sauce-like consistency. Discard the thyme and adjust seasoning (it will definitely need more salt by this point). Note: can be made a day ahead and gently rewarmed. If the cream sauce becomes too thick, add a little more cream to thin it out (probably could use milk or half and half by this point if you’re out of cream).